ERIC REID: It's Dwyane Wade's house, but it's now also LeBron James' kingdom. LeBron, on behalf of all South Florida, thank you. Welcome. How does it feel wearing a Heat uniform? LEBRON JAMES: Wow. I mean, it feels right. It feels right. And to be in this position to wear this Heat uniform every single night, we're going to make the world know, not just this league, we're going to make the world know that The Heat is back. ERIC REID: LeBron, you met with six teams. They all made very professional presentations to you. What stood out about The Heat's visit with you when you met with The Heat brass? LEBRON JAMES: I think Pat and Micky, Nick Arison, those guys, everyone who came up, they were stand up guys. The organization is a close knit group. It's all about family, and that's what I'm all about. When they said we had the possibility of all of us joining together also, I couldn't turn that down. ERIC REID: So it's Wade's house, LeBron's kingdom, and Bosh's pit, baby. Visitors beware. Visitors beware. Enter at your own risk. Chris, in 2008, the three of you were on the United States Olympic team in Beijing and on your way to gold. And this is a solid gold trio, baby. On your way to gold, you guys began to dream about some day playing together. A few days ago you thought it might be pie in the sky. That pie tastes pretty good right now. ERIC REID: Welcome to Miami, Chris. ERIC REID: What do you want to tell these people? CHRIS BOSH: Well, I'm not going to lie to you. When I first heard the possibility of all three of us playing together, I really had to go home and think about it. I said there's no way. Of course it sounds nice, but I'm not sure it's going to happen. The days and months not the days, the months, but the months passed by and me and Dwyane, we wanted to come here, and then LeBron wanted to come. I mean, let's get it done, man. Let's get this thing done. ERIC REID: I want to ask you two a question first. Chris, first of all, what turned you on to coming down here. What was your presentation like from the Miami Heat? What stood out to you? 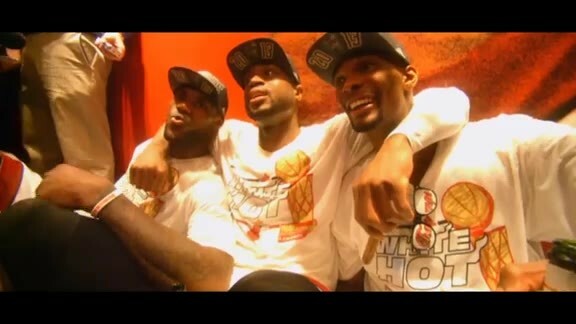 CHRIS BOSH: Like LeBron said, it's about family here and the organization. And every time I hear the Miami Heat, I hear first class. That's all I hear from everybody. And I was telling my friends, you know, this is a world class organization and a world class city and a world class arena. And we're going to bring some world class basketball to this arena with these guys right here. ERIC REID: Jose has a question for you, Chris. JOSE PAÑEDA: Chris, talking about world class. You might have been watching the World Cup. You see the passion. But there's no more passion than this Latin Hispanic city of Miami. (Spanish). We do everything here with salsa, with merengue and with some serious passion. Now, Dwyane, Dwyane might have told you a little bit about it here. He knows a few words in Spanish. I know I taught him a few. LeBron, I don't know about you, we'll work on you. Don't worry, we'll get it. But I hear I hear (Spanish). JOSE PAÑEDA: For Latin fans, and they are numerous out here, why don't you give them some taste of your Spanish. (Spanish). ERIC REID: You know, we know South Florida's Hispanic community loves the Three Kings parade. It just started. I want to go back to Dwyane and LeBron for a moment. Guys, you've had some of the greatest match ups individually in NBA history. It's been show stopping every time you two step on the floor. Tell these fans your thoughts about wearing your Superman capes for the same team. What's it going to be like, Dwyane? DWYANE WADE: You know, I look forward to day one, to every matchup against LeBron. And now I guess I'm going to have to look forward to every practice against LeBron. Because it's going to be amazing to be on the court, to know that connection that we have. Not only will we be playing against each other, but when we have played together, it's going to be there. It's just a look. And you know it's time to turn it on. So I feel sorry for whoever gotta guard both of us. ERIC REID: There is not enough kryptonite out there; there is not. LeBron, what is this going to be like? LEBRON JAMES: I mean, just like D Wade just said, we're going to challenge each other in practice. And the way we're going to challenge each other to get better in practice, once the game starts, I mean, it's going to be easy. I mean, with me and D Wade running a wing, Pat could come back and play like he was back in his Kentucky days. Just throw it up there, we're going to get it. ERIC REID: We know you guys are going to enjoy the sun and the fun and all the spoils of South Florida. But we also know you Three Kings came down here to win championships, not one. Championships. ERIC REID: Tell us about that. LEBRON JAMES: Not two, not three, not four, not five, not six, not seven. Hey, and when I say that when I say that, I really believe it. I'm not just up here blowing smoke at none of these fans, because that's not what I'm about. I'm about business. And we believe we can win multiple championships if we take care of business and do it the right way. ERIC REID: I know you three guys are anxiously awaiting to see how the rest of this team is put together. What's important to you three guys as the rest of this team now will be assembled around the three of you? Dwyane, why don't you start. DWYANE WADE: Sacrifice. This team right here is going to be built on sacrifice from all of us. And that's not just from a money standpoint. That's not just from a shot standpoint. That's everything about this. We're about business. And we're going to have fun. Yeah, it's going to be Hollywood down here. Yeah. That's what they say, yeah. But when we step on the courts, it's going to be about business, and everyone who wants to be a part of this organization is going to have to make that sacrifice. See, he just sacrificed his arm. Way to go. ERIC REID: LeBron, we know you'll do everything humanly possible to win a championship here in Miami. LEBRON JAMES: Absolutely. That's the only reason I'm here, man. I'm here to bring another championship, to bring that feeling you all had a few years ago, when y'all was able to win that championship. So me and C.B., we're here to make that feeling come back. ERIC REID: Chris Bosh, you've got to feel like the luckiest big man in the world right now. CHRIS BOSH: Oh, yeah. I mean, for one I get to when I get a rebound, I got LeBron on my left I can outlet to, and I have D Wade on my right. Like a video game. I don't know. I mean, that's all I gotta say. Yeah, I'm lucky. I'm lucky. And you know what, everybody's been really receptive here. Thank you for coming out on such short notice, like you said before. This is amazing. This is amazing. ERIC REID: You know what, Chris, we're all lucky. We are all lucky. Ladies and gentlemen, this is the first time in our beautiful 22 year history of the Miami Heat that you have seen this. It's unprecedented. It's out of this world. Let's hear it, LeBron James, Dwyane Wade, Chris Bosh, your Miami Heat.